It’s the Big One’s birthday at the beginning of September and she’ll be in school on the actual day. This means I need to navigate American birthday traditions. This sounds fine. First I had to work out what a cookie cake is but luckily the Internet is a very useful information source, even if our Internet speed seems to have dropped to levels last seen in 2000! (Good job we’re not paying a fortune for it. 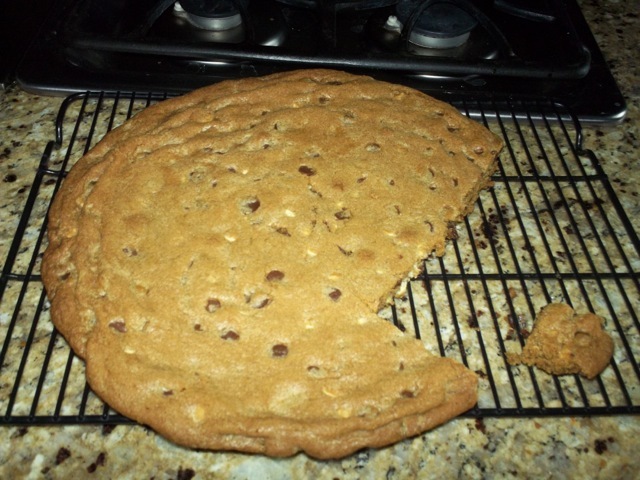 Oh no, actually we are…) It seems that a cookie cake is one of those things you can buy from Millie’s Cookies in the UK – a huge cookie that would make you sick if you ate the whole thing. Both girls have tried these cookie cakes at school birthdays already and haven’t liked them. They normally come covered in lots and lots of brightly coloured icing (the Little One’s eczema on her face is back with a vengeance having been back in school since only Tuesday but having consumed many unnaturally coloured foods already in that short time!) The cheapest one I could find from a bakery was $39 (I can almost hear my Lovely Husband saying “How much? !” from Vancouver where he is for work right now! ), although I’m sure Walmart might do a cheaper one… But I’ve looked at the ingredient lists on foods from Walmart and they’re a bit scary! There is nothing that we don’t like about it. It tastes like the delicious cookies you can buy slightly warm in Marks and Spencers in the UK. It’s just much, much larger!